Dreams of holidaying in the sun get Britons saving like nothing else can, the results of a new study suggest. More than one in four (26%) of those surveyed for Nationwide Building Society say they save up so they can go on holiday - with travel insurance potentially among the associated costs. That makes holidays the biggest motivation for saving, ahead of Christmas (15%) and putting money away for a rainy day (15%), a new car (9%), or a deposit on a house (8%). The survey also suggests that people's holiday funds are much likelier to be built up in current accounts than traditional savings products such as Isas. Some 45% of those questioned say they use a current account for their savings. That compares to 25% who choose a taxable savings account for their nest egg and 34% who opt for a cash Isa. Just 5%, meanwhile, use stocks and shares Isas to grow their savings. The typical cash Isa is now offering an interest rate of 1.38%, financial information website Moneyfacts says. But many current accounts offer rates that compare favourably with savings accounts, as well as offering cash-back deals. 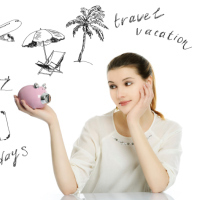 Although Isas currently have tax advantages, f rom April 6 many people saving up for a holiday - or anything else - will have a new personal savings allowance that will mean they no longer have to pay tax on the interest they get from other accounts. People paying tax at the basic 20% rate will be able to earn as much as £1,000 in interest on their savings without having to pay tax on it. Higher rate taxpayers paying 40%, meanwhile, will be able to claim up to £500 tax-free. Those paying the additional 45% tax rate will not be entitled to a personal savings allowance, however.